Somewhere in northern England one December in mid- to late 14th century a runaway priest , our first person narrator, comes upon a dead man’s body, quickly hides, and then the dead man’s companions show up. This priest, who goes by the name of Nicholas, has encountered a group of traveling players whose occupation is to present portions of the Bible for the entertainment and enlightenment of various local communities. See http://www.theatrehistory.com/medieval/mysteries002.html for some background. But now with their beloved Brendon dead, who will play the role of the Devil’s Fool? The priest of course, and he pleads for the role basically because he’s hungry. But now they discover that a man of the village was found dead just two days prior. It is thought that a certain woman killed him and she has been arrested. This starts the crime element which predominates as plot. The group puts on their Fall of Man play for the community and it does not go so well for the impoverished little band. Later they wonder if it was the fact the audience knew the ending beforehand. Also there is a brief discussion about if God can be presented as if he were just a part in a play ensues some say yes, others no. To Nicholas it’s a heresy. To Martin it only makes sense. And so following his own logic, Martin develops a plan to present a play for which the audience does not know the ending. About what? About the murder. The “man” was a 12-year old boy and they go through other little facts Martin has picked up, but why was the monk in the house? It was he found who the money there. The group presents the play the first time. They make a lot of money and that gets to them to do it again – even more real – and then skip town. The monk in the town (not the player) is Benedictine which means he’s freer to go where he wants than some of other orders. He is corrupt for sure. The group has decided to do the play again, but have to question the townspeople further. The monk met the woman – ? The monk met the boy? The woman met the boy and took him home? The boy was found on the road? So many possibilities for the players to think through for their play. So many twists as they try to bring a play to reality – in several senses of the term. Great plot line inside the somewhat difficult language and the characters are well enough developed. The tension and suspense are excellent. The themes are common enough – masks and their purposes in theater and life – losing our true selves to the mask, what is reality, when does literature become reality, forms of love, forms of sin. But they’re very well presented – introduced in the first third and developed through plot action. I knew little of the world, as the Justice had seen, but I knew that we can lose ourselves in the parts we play and if this continues too long we will not find our way back again. Unsworth, Barry (2012-01-10). 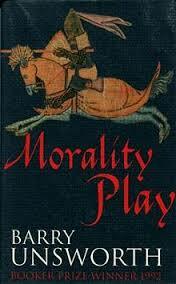 Morality Play (Kindle Locations 2685-2686). Knopf Doubleday Publishing Group. Kindle Edition. About Maloney’s reading – he has a nice voice, but reads the material so fast and at such an intense emotional pitch it’s impossible to think about what’s going on – it’s barely comprehensible in many places. I tried to use the “slow” setting and that brought his speed down enough, but at that speed there’s a frequent echoey warble. Not good. I wouldn’t try to understand it from the audio version alone. Bottom line – although it’s short, this is not an easy read in language, plot or themes but when you get involved, it’s brilliant.